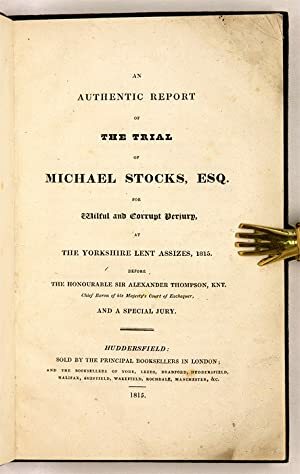 An Authentic Report Of The Trial Of Michael Stocks, Esq. For Wilful. Illustrator: London, 1815. OCLC locates no copies this imprint. The Lawbook Exchange, Ltd. specializes in all aspects of law and legal history. 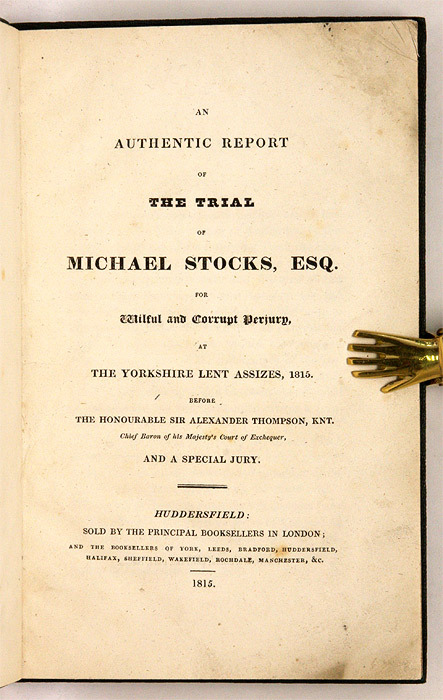 Our publication program offers reprints of over 800 landmark works as well as original books. We invite offers of antiquarian, scholarly and current practice materials. Founded in 1983, we currently serve thousands of individuals and institutions worldwide. Law books - Out of print, Scholarly, Rare, and Reprints of Legal Classics. We also handle secondhand primary and secondary source material for practicing lawyers. Generally someone is available Monday-Friday 9:00 - 6:00PM(Eastern Time). Member of the Antiquarian Booksellers Association of America and the International League of Antiquarian Booksellers. All items are offered subject to prior sale. All prices are net. Appropriate sales tax will be added for residents of New Jersey. Foreign remittances must be in U.S. dollars, by check drawn on a U.S. bank, by international money order, or by wire transfer. We accept Visa, MasterCard, and American Express credit cards.